The 1859-O Coronet Double Eagle is one of the rarest and most important $20 coins. Double Eagles (face value $20) were first coined in 1849. Of that initial trial group, one lone specimen survives, reposing today at the Smithsonian Institute. Full scale double eagle production began in 1850. The obverse design featured Liberty wearing a crown, or coronet, in a manner very similar to the already circulating $10 eagle. A new theme was employed on the reverse, depicting an eagle in ornate surroundings. The Coronet Double Eagle was minted every year up to 1907. There are many scarce dates in the 57 year run of the Coronet Double Eagle. One of the most elusive of all is the 1859-O. Only 9,100 pieces were struck, of which about 85 exist today. Of the 150+ Coronet Double Eagle dates, the 1859-O ranks somewhere around sixth in rarity and importance, yet it is not so ultra rare as to put it beyond reach. Less extraordinary collectors who carefully marshal their resources have a shot at owning one. In 2003, the survivorship estimate of the 1859-O Double Eagle was upped by two, following the discovery of the SS Republic shipwreck. The vessel was lost in an October 1865 hurricane off the coast of Georgia, taking down $400,000 face value in gold and silver coinage. Included in the coin hoard brought to the surface were a couple of 1859-O $20 coins, both in near mint condition. 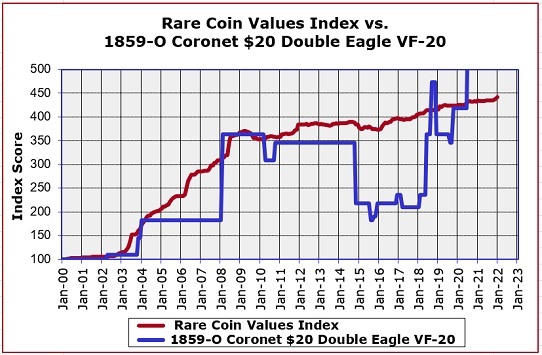 As one might expect for an exceptionally rare United States coin, the 1859-O $20 Double Eagle has increased in value steadily over a long period of time. The blue line above charts the percent increase in value since Year 2000 of the 1859-O in VF-20 condition. This compares fairly closely to the Rare Coin Values Index, as shown by the red line. The Index is a composite score (i.e. percent value increase) of a representational group of 87 rare US coins. The Index uses Year 2000 as its baseline also. The goal of charting the Index score is to get a feel for the direction and strength of the overall US rare coin market. The 1859-O Double Eagle is one of the 87 coins tracked in the Index. All charts are updated monthly.